To get a professional manicured lawn it is necessary to mow your lawn on a regular basis. A proper mowing schedule will cause less stress on your turf allowing it to look it’s best. But there is more to properly caring for your lawn than just mowing it consistently. Our lawn mowing experts are highly trained in best practices for maintaining yards here in Florida. For example we stagger our mowing pattern, line trim around flowerbeds, trees, fences and other obstacles in the lawn, edge along concrete surfaces and we are sure to blow off your sidewalks and driveway. Our commitment to quality lawn mowing service doesn’t stop when we are done mowing your lawn, we meticulously maintain our equipment by cleaning our mowing decks and sharpening the mower blades consistently so we deliver the perfect cut with each service. Line trimming (weedeating) around trees, flowerbeds, fences and other obstacles in the lawn. Edge sidewalks, driveway and patios. 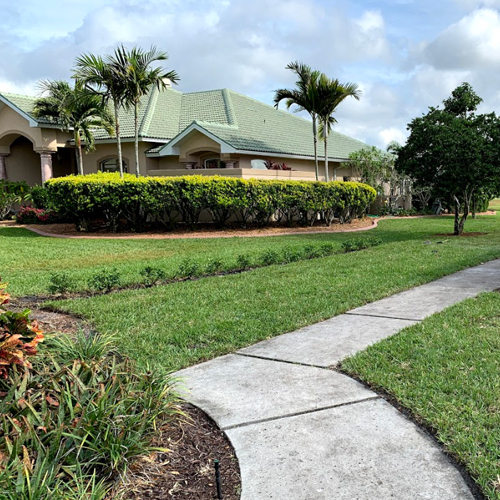 At Tropical Gardens Landscape we offer weekly and bi-weekly lawn mowing services in Sarasota, Siesta Key, Bird Key, Casey Key, Lido Key and the Longboat Key area. We recommend weekly lawn mowing service which is our most popular service, but we also offer bi-weekly lawn mowing services. So you can decide which option is best for you. Tropical Gardens Landscape has been providing lawn mowing service in the Sarasota Florida area since 2007. Our weekly lawn mowing service is the recommended and most popular service for the area because you get the best results and a healthy green lawn. For weekly lawn mowing service we mulch the clippings into the lawn as this is healthier for the lawn. Grass clippings are mainly made up of water and actually contain nitrogen, phosphorus, and potassium that are found in fertilizer. Mulch mowing can provide one-third of the annual fertilization needs of your lawn each year and does not contribute to excessive thatch build up when mowed weekly.